Simon Poelman's legacy to New Zealand athletics is that of the greatest all round athlete in it's history. His outstanding and, probably, under developed ability at a wide range of events brought him successes at many major events. He is also remembered for one or two highly publicised 'failures' at major Games. Poelman's first successes came in 1981 when he won the national under 18 pole vault and junior decathlon titles with 4.05m and 6621 points, excellent early efforts. The following season he was selected for his first national team for the multi events test against Australia in Christchurch. Poelman, still a junior, came third in the senior decathlon. 1983 brought more honours and his first 7000 point decathlon in Adelaide at the Australian nationals while the following year saw his emergence as a senior champion, winning the decathlon. At the 1985 Pacific Conference Games in Berkeley, Poelman won the bronze medal scoring 7553 points, well back on his best of 7827 scored in January, but a pointer to great things to follow. These great things started in 1986 at the inaugural National League final in Auckland when multi event competitions were held in conjunction with the League. Poelman broke loose and put up a World class 8158 points making him an exciting medal prospect at the Edinburgh Commonwealth Games. He did not disappoint winning bronze with 8015 points. The following year was even better, improving to 8366 points, ranking him fourth in the World for 1987. At the World Championships, he finished sixth with 8296 points. 11 points from fourth and less than 100 from a medal. It was another outstanding effort and hopes were high he would continue to improve in 1988. 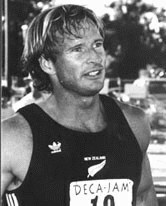 Early 1988 produced a competition in Auckland, put on by his North Shore Bays Club, that showcased him in a one hour decathlon. He had tried then before and done very well but in 1988, he set a World best of 7647 points, an effort in one hour that no other New Zealand decathlete had managed in the regulation two days to that time and only one since. Poelman's allround ability was on display at it's best in the 1988 nationals in Hamilton where he won the 110m hurdles, pole vault, long jump and 100m, but he had an upsetting start to the Olympic decathlon in Seoul, when one of the other athletes, West German Jürgen Hingsen, made three false starts in Poelman's 100m heat. Poelman continued finishing 16th, a highly commendable placing in such a demanding event but a failure in the eyes of a very demanding public. 1990 brought a return to glory on the home front. Poelman claimed the silver medal in the Commonwealth Games decathlon with 8207 points and surprised many with a bronze in the pole vault with 5.20m. Within a month, he had beaten his best one hour decathlon and set a new World best of 7774 points, a total only surpassed by one athlete since, Robert Zmelik, the 1992 Olympic champion. Poelman finished sixth at the 1991 World Championships in Tokyo with 8267 points but 1992 saw him withdraw from the Olympic event with injury. In 1994 he was provisionally selected for the Victoria Games and had to put up a performance acceptable to the Games selectors to confirm his place. He achieved this but in the Games event, again withdrew with injury much to the disgust of the public. Competing at the 1995 World Championships, Simon Poelman completed the decathlon in 13th place with 7969 points, a creditable effort in a large field of 30 that justified his selection. Only Chantal Brunner placed higher at those Championships for New Zealand. The last couple of years have been quiet for Poelman but he has, again, been selected in the provisional team for Kuala Lumpur. Simon Poelman, one of New Zealand's most gifted athletes, will be remembered for his excitable antics such as back flips and somersaults, when he has produced a pleasing effort, entertaining the crowds with these as much as with his undoubted athletic ability. He was a warded a New Zealand 1990 Medal.